Perfect fried zucchini blossoms. Photos by Donna Turner Ruhlman. Signage in Italy is an issue. They have millions of signs all pointing in various directions. On our way to Barga the next day, we passed half a dozen signs reading “Barga” and Donna wanted to follow them all, but I kept telling her to go straight, reading my iPhone till she finally said, “That’s it,” turning right off the main road after the fourth sign. “It says Barga, I’m following it.” We ended up turning around anyway and found Barga, only to realize that our hotel was not actually in Barga. We had arrived. Alessandra insisted we have an aperitif and some cheese to soothe the travel nerves. It worked! But what I didn’t expect was dinner. After a much-needed nap and a stroll through the hamlet where we paused for a coffee, Alessandra asked if we’d be having dinner at the hotel. As there was no restaurant we could see in town, we said “Of course.” Here’s the unexpected part. Or part of the unexpected part. As we were the only guests, we’d be having dinner with Alessandra and her husband, Sergio, and their two French interns, working at the hotel for the summer. That we got there was a surprise. That we made it through the tunnel was a surprise. The zuke blossoms were a surprise; the wine and the new grape were a surprise. We were indeed surprised to be sitting at a table for six with the proprietors of the hotel. But the biggest surprise was the meal itself. A traditional Italian family-style meal. Panzanella salad—day-old bread soaked in water and wrung out, crumbled and tossed with tomatoes and onions, vinegar, and oil. Alessandra got up to make the zucchini soup (it was zucchini season)—nothing but sautéed baby zucchini, water, and herbs, including fresh mint. Light and flavorful, garnished with the olive oil on the table. Next, a zucchini pasta (it was zucchini season). Then the main course, roasted goose, with potatoes cooked in the goose fat. Alessandra explained they’d given a neighbor some wood earlier in the season and he had brought by a fresh goose today. 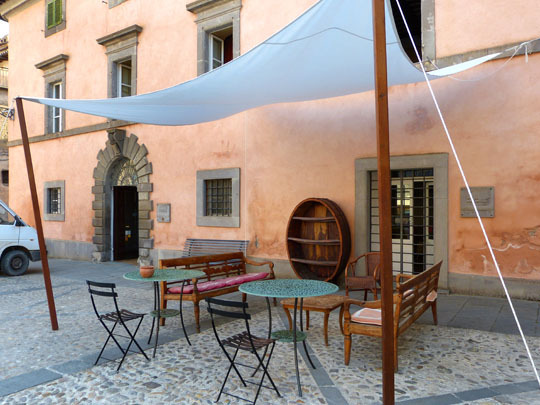 Dessert, homemade gelato, followed by a sweet sparking wine beneath the canopy in the square outside the hotel, and more easy conversation. During the meal, I’d thought about how we so often eat: Fill up a plate with several courses, bolt it down, and dinner’s done in 20 minutes. No comparison to a couple hours at the table, leisurely talk, plentiful wine, all anchored by the food of incredible simplicity, especially the first two courses featuring day-old bread and tap water, and so delicious and satisfying. Rome, not to mention Cleveland, felt far away. We fell asleep to the rapid and happy Italian conversation between Sergio and a neighbor echoing in the square (only recently did we learn from vinoroma that he is “one of the biggest and most important [winemakers] in Italy.” When we awoke, early, he was gone to the vineyards. Alessandra helped me with directions. We had Barga to find, where another extraordinary meal awaited. 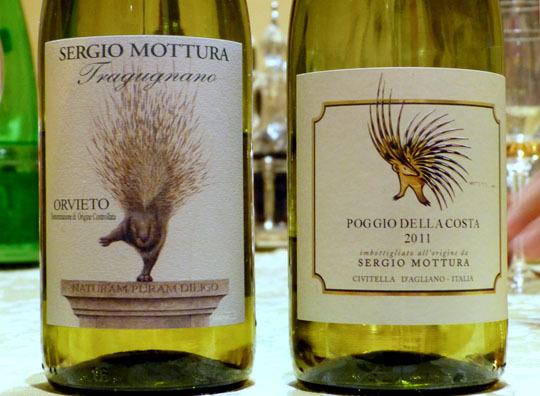 Sergio Mottura, above, pouring, and two of Sergio’s wines, with their porcupine (istrice, in Italian, and delicious according to Sergio) label. The square outside La Tana dell’Istrice. 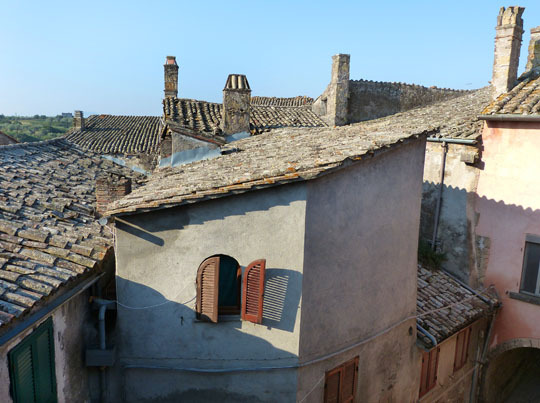 The rooftops and buildings of Civitella d’Agliano. Alessandra helps me plot a course north out of Lazio and into Tuscany. Sauté the shallot in a tablespoon of olive oil over medium-high heat till translucent. Add the zucchini and summer squash and cook until tender. Add enough water so that everyone will have enough soup. Bring the soup to a simmer for 5 minutes. Season with salt and pepper, tasting it till it’s perfectly seasoned, and fresh herbs. Serve, garnished with plenty of delicious olive oil. Yield: Exactly as many as you’re cooking for. My post on Israeli Couscous with Butternut Squash. Learn how to make crema de flor de calabaza or squash blossom soup, via Kitchen Konfidence. Haha, this brought back such vivid memories of my own trip to Tuscany, where we also got hideously lost and couldn’t figure out where any of the hundreds of signs were actually pointing – except it was also after midnight and none of our phones were working and we somehow ended up (briefly) following a dirt road into the woods. Oh, and we didn’t have dinner waiting for us, either… plenty of booze, though, thankfully. What a fantastic post, I want to go to Italy even more now, thanks. Wait, is your toenail BLUE? Of all your posts, Michael, this is my favorite. “Yield: Exactly as many as you’re cooking for.” It doesn’t get any better than that. Oh God, How Wonderful! Thank you for brightening my day! Mike: Curious what your take on the bread in Italy is. My wife and I went there in ’09 (Florence, Venice, Assisi and Rome) and while we were generally bowled over by the amazing awesomeness of the meals we ate, the bread was one place where Italy fell short for us. It just seemed surprisingly bland. Vince that’s funny, Flo Fab’s article is from 1982. There isn’t much of a shortage of bakeries in Florence right now. I assure you. To be fair however, there is a shortage of legally operating bakeries though because of taxes and licensing costs. If you’re up at 4am, there are a number of “secret” (illegally operating) bakeries you can find in the mornings if you follow your nose. While on the topic of taxes, but from the article: Dante’s points about the salt are…a bit too poetic. The taxation of salt by Pisa is the more historically accurate reason for the traditional and stubborn lack of salt in Tuscan bread. You may also come across the notion by some Italian food personalities that the salt in the bread is missing so as to not over power the simple flavors of the food. That is just their attempt to justify their ridiculous attachment to the past. And have something to tease unwitting tourists with. In present day Florence, it is common to receive in most restaurants typical Tuscan bread (saltless) as a nod to the past as well as a selection of normal bread or rolls made with modern ratios. And salt. Gahh! That’s what I get when I read and reply too quickly! Looked at the wrong links… referenced the wrong people. I’m a mess tonight. Apologies to Vince, et al. So it is the lack of salt. That was one of our theories. Explains a lot. My wife and I have had a similar experience. However, our experience was that the bad bread is limited to Tuscany. This is because they don’t put any salt in the bread. Personally, I think this makes it flavorless, but the Tuscans apparently do this because the food should not be outshown by the bread. As for your experience in Rome in Venice, I think you just went to the wrong places. I have had some pretty high quality bread service in both Rome and Venice. The bread in Tuscany is made without salt. It’s pretty nasty! Michael, one of your best! We spent three weeks living in a farmhouse in Tuscany 10 years ago. It took two of those weeks to figure out the unsalted bread. It’s perfect with the food once you do figure it out. You can really taste the grain. MR, you led the Italian life in Italy! Wonderful! Technology is great, but even suri can’t conjure up experiences like this. The funny thing is, you have to got through that initial stripping of layers that getting lost on a trip provides so that you have the capacity to truly absorb and enjoy the wondrous serendipity of it all…life can be one big happy accident. Looking forward to hearing more! yes,the stripping of layers, you’re absolutely right. I love this! I have been thinking about writing and asking you to add some posts about aperitivos and digestifs. I just listened to Blood, Bones, and Butter (I read it when it first came out), and it was just delicious to listen to Gabrielle Hamilton read her own book. It also made me want to have a negroni before dinner, (especially since her recipe in the NYTimes includes my favorite gin, Plymouth. Your Friday cocktail posts are so much fun, but I would like to hear your thoughts and how and when to enjoy a cocktail, as well as what to do about after-dinner drinks. I love the way Italians eat. I thought this recipe would be about the photo being displayed at the top, the zucchini blossoms but I can’t find the recipe for it anywhere in this article. I only see how to make the soup. Sorry, donna didn’t shoot the soup because she was eating it. 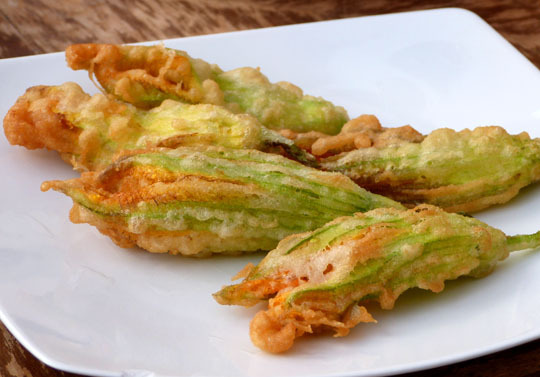 To make this kind of zucchini blossom, make a light batter of flour and cornstarch, a little baking powder and sparkling water (or prosecco! ), dip the leaves in the batter, fry till crispy and eat. If you have great anchovies, put them inside the flower before battering and cooking. Non c’è problema! Capisco:-) Grazie, Signore, per le informazioni e le istruzioni. My family lives in Italia and I went back home to see my cousin get married. I am back in the States now and I can’t tell you how badly I miss home and the skinny roads, the architecture, old buildings, meals that go on for hours, etc. Thank you for showing your photographs and sharing your story; I enjoyed it all. Great Story!!! LIke always very entertaining Michael. My lucky blue traveling toenail. When my daughter was three, she painted my toenail blue. I was on my way the next day, by chance, to work on the summer section of Return To Cooking, with Eric Ripert. I hated to leave Donna and my daughter and missed them terribly whenever I traveled. But everyone asked me during the trip, why was my toenail blue? I liked telling them about my daughter. When looked down at my foot, in the shower, in the pool, on the beach I thought of my daughter and it made me happy. When the next summer’s travel happened, I asked my then four-year-old to paint my toenail blue. She delighted. I loved to tell people why my toenail was blue. It still surprises me, and makes me happy. The tradition carried on pretty much like that for 12 more years whenever I traveled in summer, through last year. This year, that cute daughter having morphed into a 17-year-old, refused. Last year painted it, but grudging. This year? So it’s up to Donna or me, sadly, but it still makes me happy when I travel to think of my daughter, and to think of home. I thought I spotted a blue toenail, and ‘m glad you told this story… such a fun tradition. It cracked me up that your daughter refused to do it this year though! Ah, the toe. It’s a very sweet story. I wanted to take a picture of it but didn’t quite know how to broach the subject at Le Frechou. Ha! You should have asked, I’m not shy about toenail! This story strikes me for two reasons. First when I was a teenager my grandmother picked pumpkin blossoms from her garden that I would fry up, very similar to the zucchini blossoms. But I have not had them for years. 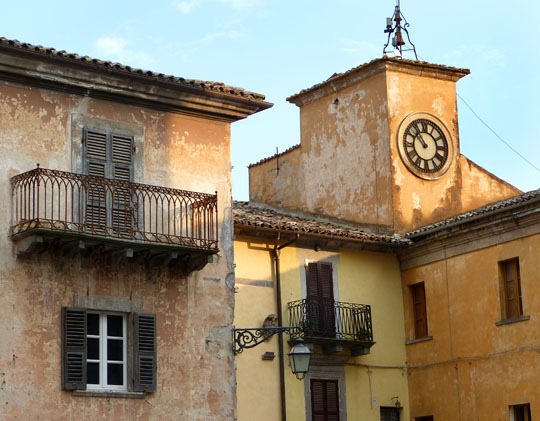 Second, I am planning a trip to Italy in January with my significant other and his family comes from Barga! We were hoping to go on a day trip to Barga from Florence, but I think we we will take a train or bus rather than drive. I would rather not get lost. LOVE this post! My daughter lives in Bracciano (a small town on a big lake between Rome and Viterbo). I am constantly amazed at the emphasis on what’s seasonal (especially in small towns). My last visit there I was so hungry for melon gelato. Nope … not in season. Artichokes? Come back in a few months. What could be frustrating to Americans used to things trucked in from all over is really a blessing. What is served is so fresh and so simple it’s magical. Food just tastes better in Italy and the experience has changed my shopping and cooking habits here in the U.S., too. 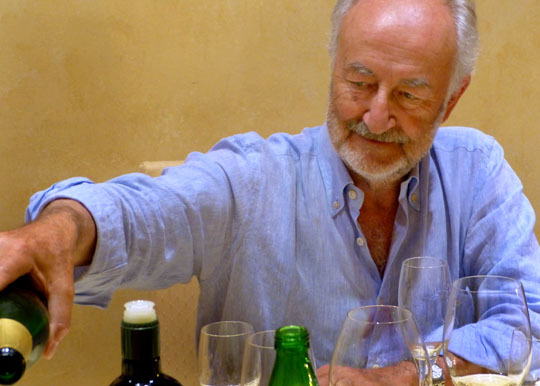 not to be avuncular, but now you understand Italian cuisine. Food that isn’t fetishized or overanalyzed, food that’s just delicious because why would you eat anything else? that’s awesome. And I totally get it. I sell the world’s finest caviar, and I work from home – when I’m not in kitchens doing tastings with chefs. Today I was leaving a message — and my 3 year old came screaming around the corner. I can only hope the din of the kitchen when the chef hears the message drowns her out. They’re little for such a short time. I don’t want to miss it. As hard as it is to work with them under my feet. My blog – was named for my son. Couldn’t understand a word the kid said, until you’d bring him to the table. At which time he’d look at the food in front of him and exclaim, “yummy yummy Schlurrrrrrrrrrrrp” We’ll never forget it. I hope her something blue on her wedding day is your toenail. Painted by her. So great! Both stories — toe and Italy. I hate you, this looks so incredible. kinda like poetry,very sweet,shortish,but transforming,brilliant. Writing from Singapore and truly love this post. 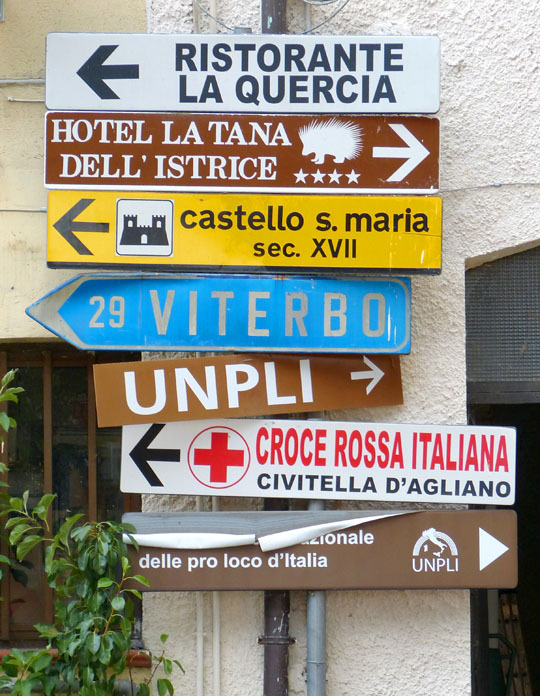 Can identify with you on the road signs as my family just visited Rome, Tuscany, Florence and the Ligurian coast in June this year and we were also stumped by the way the directions are displayed on the signs. Thankfully our Garmin was a gem and rarely got us lost. Loved the food served up in the different regions and the slow and leisurely meals we had. How often as tourists we just want to grab a meal and move on to the next destination but Italy has taught us that a slow meal IS the way to go. Btw, those blooms look awesome!! Such beautiful pictures and from Portofino too. Happy Birthday to you and Donna. Great story as usual! am sure you were busy and taken care of — but next time– I live in Tuscany and have since 84– we spoke at IACP in NY— would have loved to taken you around my “hood” and my butchers! My honeymoon was 2 weeks of ‘getting lost’ and just exploring that area. Love the narrow winding roads. Each morning started with picking which road sign to follow. It still is the best trip of my life. Oh I wish we could go there right now!